Subscribe To the Bi-Weekly Newsletter -The Samaritan Update. The Samaritan-Israelite Passover sacrifice was a impressive event this yearr to many new visitors to the mount. Many people contacted us though our website www.the-Samaritans.com and www.thesamaritanupdate.com for the Passover event. 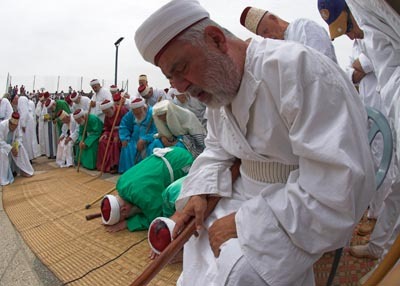 Among the contacts were eight persons from a study group from Jerusalem, a French photo journalist, Olivier Martel, who is interested in doing a featured magazine on the Samaritans. Also journalist Jean-Louis Tremblais from Figaro Magazine made the occasion. We received an email also concerning the visit of the ambassador of Switzerland in Israel, the Ambassador of Austria in Israel, a number of persons from the European Union in Jerusalem, a representative of Switzerland in Ramallah, a number of persons from the French consulate in Jerusalem and from other consulates and students from the Studium Biblicum Franciscanum and Ecole Biblique in Jerusalem. Also visiting was the wonderful photographer Edward Kaprov. The well-known scholar Alan Crown from down under in Sidney, Australia, was honored by his colleagues with a festschrift. The event recently occurred on April 11 with several essays of Samaritan interests. Dr. Crown is well known and respected for his numerous books and essays on the Samaritan-Israelites. His most recent articles include an article on Samaritan Midrash in the Encyclopaedia of Midrash (2004 Brill), 'Samaritan Judaism' (10,000 words) in J. Neusner, M. Peli, eds. Encyclopaedia of Judaism, Supplement 2, ( Brill. Leiden 2004) pp. 2241 - 2265. and in Jewish Women, the new encyclopaedia appearing this year with an entry on Samaritan women. Thank you, Dr. Crown for all your hard work and wonderful books of which most of us could not do without! Also of interest Mandelbaum publishing is about to reprint Stenhouse's Kitab Tarikh of Abu'l Fath. 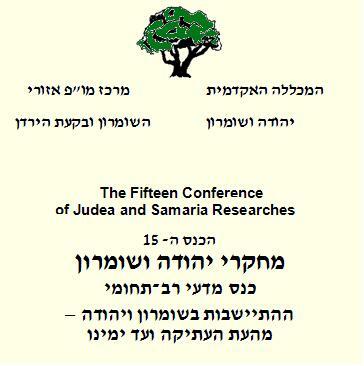 The fifteen conference of "Research in Judah and Samaria ( Yehuda and Shomron) will be held at the University of Ariel on June 2, this year. An unknown collection of manuscripts from the International Library of Ukraine, in Kiev will be surveyed by the Dr Dan Shapira from the university of Bar Ilan, in the city Ramat Gan in Israel, and Mr Darira Vasyutinsky from the Hebrew University in Jerusalem. The introduction will take place on the second seat of the conference. According to the brief of the two researchers, which was presented to Dr Yaacov Eshel, the organizer of the conference, the collection contains manuscripts in Arabic, Aramic and Ancient Hebrew. The manuscripts are from the private collection of the well known Jewish- Russian researcher Mr Abraham Harakbi, whereby he had purchased in Nablus in the 19th century. The collection will be introduced for the first time and will help some aspects of the Samaritans research of Nablus in the 19th century. Professor Dov Noy, from the Hebrew University in Jerusalem will lecture in the same conference concerning Samaritan Ratson Tsedaka, and his place as the reviver of the Samaritan renaissance in the 20 century. Professor Noy is laureate of the Israeli prize for literature, which was revealed to the Samaritans in the fifties of the last century, and since then he wrote a lot in many different articles about the Samaritans and their lives, as part of his research about the folklore of communities in Israel. Out for sale now is 'Tradition Kept', a wonderful and under priced book for the contents it contains. In general the book contains information and text on the samaritan Pentateuch, Samaritan Joshua, Kitab al-Tarikh (The annals of Abu'l Fath), additional Samaritan Chronicles, Tibat Marqe (Memar Marqe), the Samaritan Liturgy and misc. texts. A Must Buy! What do Samaritans and Jews have in Common? While the rabbis seem very cautious about offense when talking amongst themselves, they are less restrained when addressing others. Can a Kuti, or Samaritan be invited to bless a meal? 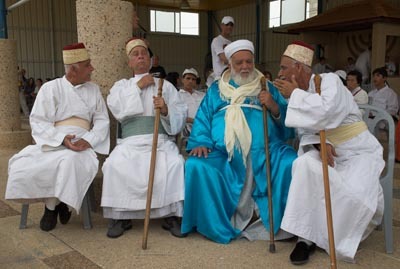 The Samaritans, who still exist in small numbers today but are more famous for a New Testament parable, were an offshoot of Jewish practice who read a Torah almost identical to the Rabbinic version but in their own script. Though the Rabbis were dubious about Samaritan claims to be descended from the Hebrews, it is decided here that since Samaritans can be even more scrupulous with mitzvah (commandments) than the Jews, and since they tithe their produce correctly, they are acceptable. I am learning about Torah and Judaism in general and I'm very interested in learning more about the Samaritan form of the Israelite faith. I have searched through the Internet looking for any sites that contains Samaritan liturgy and prayers (siddur) but couldn't find any. Are you planning to post Samaritan liturgy, prayers on your website? Also, I would like to learn more from the teachings of Samaritan sages of the past and the present-day Samaritan Torah teachers. Can you post them on your site also? Dear Togu, At this time we all are very busy but we hope to have some more information on our site in the future. We suggest at this time you purchase the Tradition Kept: Introductions And Texts To The Literature Of The Samaritans, by Robert T. Anderson, Terry Giles, Therein you will find some English translations. If you are looking for Hebrew, please go to the web store at www. The-Samaritans.com wherein you will find a book Siddur Hatfilot: Prayers for all year round according to the Samaritan customs by Israel Tsedaka. The prayers are written in Samaritan script (old Hebrew script). See the-samaritans.com for the full article, You may find it interesting. Hodes, Rabbi Z. STUDIES IN SIDOOR. Publication: Belfast, P. Quinn, 1911. 118 pages. "The volume comprises a history of the Jewish ritual and liturgy in the ancient temple and modern synagogues, Sephardi and Askenazi, and what changes were wrought therein through the influence of pagans, Christians, Mohamedans, Samaritans, and Karaits. OCLC lists 10 copies worldwide. 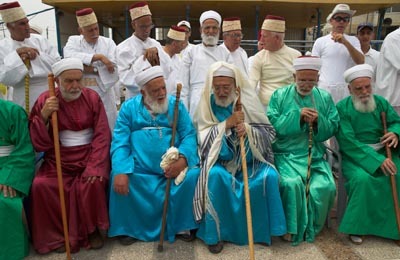 The term “Mikra” is frequently used interchangeably with “Bible” and “Holy Scripture.” Nevertheless the term carries more freight, for it means “the way in which the text has always been and ought to be recited and understood by those who have been closely connected with the texts.” The many scholars, all specialists in their fields, who contribute to this expansive volume elucidate the many translations and interpretations of the texts from the formation of the canon, through the Greek and Aramaic translations, the Samaritans, the Rabbis, the New Testament writers, the Latin translations, and the early Christian fathers. Have you ever wanted to publish a book? Or have you written something that is to costly for you to publish? Well here maybe your answer, a low cost publishing Company that will publish either online or in book form worldwide even on Amazon. Our Entrepreneur Publishing Packages are designed to help those of you who have a customer base you can access quite readily (eg: a public speaker or teacher). With minimum author discounts of 60% off the retail price, you are able to maximize your income by selling books directly to your readers. And if you underestimate the demand for your book at any event, you can provide a simple toll-free number or webpage address where buyers can order copies from Trafford's order desk. This works perfectly when you're on the road and can't carry a large volume of books with you. For each book sold through Trafford's bookstore or website, you receive a royalty that is about double what traditional publishers pay! Here's how you can have the best of both worlds while your book proposal is being circulated. If you land a publishing contract before we start work on your book, we'll give you a 100% immediate refund. If you decide to try the stepping stone concept, you can feel comfortable knowing that Trafford authors always retain their full copyright and can end the agreement any time another opportunity presents itself! Click Here to view this information online. We would like to thank you for visiting our website, The-Samaritans.com in the past and hope you visit us again real soon. We ask you to forward this Update to your friends. The purpose at our web site is the education of the existence and history of the Samaritan-Israelites, descendants of the ancient Kingdom of Israel. Recently we have been working on expanding our web site. We do hope you enjoy visiting our site and recommend it to your friends. The-Samaritans.com .